what the water says: radioactive? 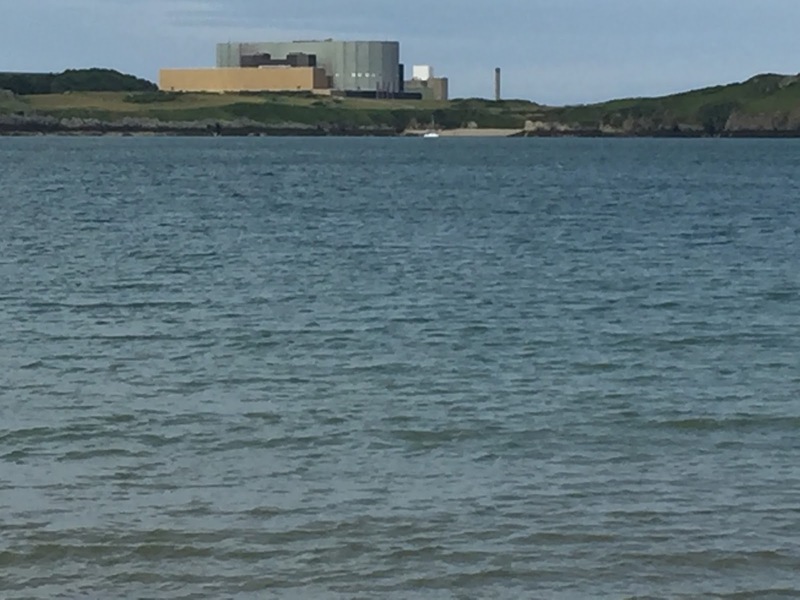 On a lovely walk, in fine weather, on the north coast of Anglesey, we looked back at Wylfa nuclear power station, recently de-commissioned. 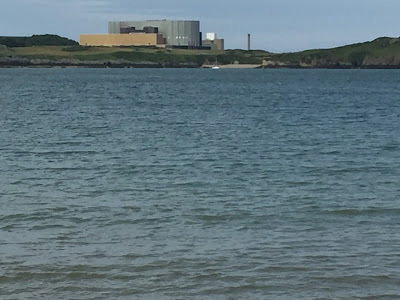 Now "they" want to build another one, Wylfa B, or "Wylfa Newydd" yn Cymraeg - the "New Wylfa." How you look at this curious structure, in the literal sense, depends on how you look at it, in the metaphorical sense, i.e. how you feel/think about nuclear power. If you think the safety risks of a serious accident from such a place are negligible; or if you think the radioactice waste problem will be resolved safely in the next N years; or if you think it's a ridiculously dangerous project the waste from which we'll be bequeathing to the planet and its ecosystems for millenia; or if you think it's needed to combat human-generated global warming and to secure electicity supply, or..well, that's enough, the point's obvious. So your view of reality - what is real for you - depends on your point of view: the thoughts, opinions, emotions that you characteristically deploy in association with something out there in the "real" world. But the real world is what we make it. We still talk about the sun rising...so it seems to. This excerpt, found on the website "Brainpickings," turns all this into a wonderfully paradoxical circle. I had to read it slowly, letting each stage sink in a bit. So your nuclear power reality will not be the same as mine. Can I find a harmonious balance in this scene - a lovely bay on the Irish sea coast, and a nuclear power-plant? In the political realm, choices have to be made. We can't simply let go and accept. But we might remember the immense power of paradox and contradiction. It's central to a part of Buddhist thinking and doing that I've found of very great value. I don't think Alfred Kazin was a Buddhist - or maybe he was? Trust to the contradictions and see them all. Never annul one force to give supremacy to another. The contradiction itself is the reality in all its manifoldness. Man from his vantage point can see reality only in contradictions. And the more faithful he is to his perception of the contradiction, the more he is open to what there is for him to know. “Harmony” as an absolute good is for the gods, not for man. A desire for the stasis of an unobtainable and absolute balance is what Kazin is warning us about. We can achieve in ourselves an equilibrium when faced with such a choice; it's not a total harmony about the thing itself, which like any complex political issue is full of contradictions. So: accident?/waste/low carbon generation/cost/energy security... we have to look at the thing through its contradictions, accepting the full reality of them, before we can find the equilibrium we need, not just on a walk, but in order to make decisions about it.